Fennel is one of nine herbs that are considered to have a miracle in the Anglo-Saxon. In Indonesia has grown, sometimes as herbs or medicinal plants. This plant can live in the lowlands to an altitude of 1800 meters above sea level. But will grow better in the highlands. Originated from Southern Europe and Asia, and Because of the benefits, then start to grown in Indonesia, India, Argentina, Europe and Japan. These plants are long-lived, high 50 cm to 2 meters, grows in a clump. one Clump usually consists of 3-5 rods. Bluish green stems, grooved, segmented, perforated, when vernal smell fragrant. Layout leaves alternate, compound pinnate with double two fins narrow, needle shape, tapered tip and base, flat edge, sheathed in white. Membranous sheath with cap-shaped top. Structured as an umbrella the inflorescence flower compound with 6-40 peduncle, mather stem peduncle 5-10 cm long, 2-5 mm long peduncle, yellow crown, out of the rod tip. oval Fruit, ribby, 6-10 mm long, 3-4 mm wide, the young one has green colored, after a bit has dark brown color of green or brown slightly yellow until completely brown. Fruit color varies depending on the country of origin. Ripe fruit has a distinctive aromatic odor, when taste it, feels relative like camphor. Fennel produces fennel oil, which is distillated powdered of fennel ripe fruit and dry. There are two kinds of oils of fennel, sweet and bitter. Both are used in the pharmaceutical industry. Fennel is also used for seasoning or as ingredients that improve the taste (Corrigentia Saporis) and the scent of medicinal herbs. Usually used in conjunction with bark of pulosari. The leaves can be eaten as a vegetable. Mostly by seed or by separating the child plant. Cough, gallstones, irregular menstruation, shortness of breath, herbs or mushroom poisoning, Sprue. Finely ground dried fruit. Use it for local use on canker sores, toothache, earache, and wounds. oil Fennel can also be used to treat children colds (rubbed on the body). a. Prepare the fennel fruit powder as much as 5 grams, Pour 1/2 cup boiling water. Once cool, strain. Add 1 teaspoon of honey. Stir well, then drink at once. Apply 2 times a day until healed. b. Prepare 1/4 handheld of Adenanthera pavonina leaves, 2 pieces of hibiscus flower, 1/5 handful of Mentha arvensis leaves, 10 Lantana flowers, 2 red onions, fennel 1 teaspoon, 1 finger of Alyxia stellata, one finger rhizome of ginger, brown sugar 3 fingers, washed and cut into pieces as needed. Boil with 3 glasses of water, until the remaining half of it. After cool filtered, then drink. Do it three times a day, 1/2 glass each. Fennel fruit powder as much as 5 grams brewed with 1 cup hot water. After cool drink. Do it every day. Prepare: The leaves and flowers of Nyctanthes arbor tritis Linn, l/5 handheld each, black cumin 3/4 teaspoon, 1/2 teaspoon fennel, 1/2 finger of Alyxia stellata, 2 flowers of Lipstick Tree, lemon 2 pieces, sugar cubes as big as eggs chicken, washed and cut into pieces as needed. All material is then boiled in 3 glasses of water until the remaining 2-1/4 glasses. After cool filtered. Drink three times a day, each 3/4 glass. 4. Medicinal Plants Or Mushroom Poisoning. Prepare the fennel fruit powder as much as 5 grams. Pour half a cup of wine. Drink while warm. cinnamon 3/4 fingers, brown sugar 3 fingers, washed and cut into pieces as needed. All material is boiled with 4.5 glasses of clean water until the remaining half. after cool filtered. Ready to drink 3 times a day, 3/4 glass each. a. Take as many as 10 drops of fennel oil, brewed with 1 tablespoon hot water. Drink while warm. Do it three times a day until healed. b. Prepare: 1/2 teaspoon Fennel, 1/4 finger of Alyxia stellata, rhizome galingale two fingers, one finger rhizome of ginger, 1/4 teaspoon cumin, 1/4 handheld of (Jasminum Pubescens)leaves, brown sugar 3 fingers, washed and cut into pieces as needed. The material was then boiled with 4.5 glasses of water until the remaining half. After chilling filtered. Ready to drink 3 times daily, 3/4 glass each. Avoid the use of fennel in large doses. 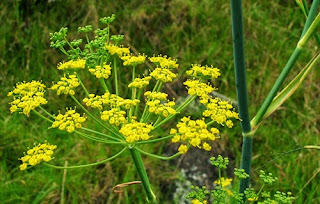 Fennel fruit effective to repel insects (insect repellent). Chemical properties and Pharmacological Effects. Fruit: ripe fruit contains an aromatic smell, taste slightly sweet, spicy, warm, entering the liver meridian, kidney, spleen and the hull. Fennel contain essential oils (Oleum Foeniculi) 1-6%, containing 50-60% anethole, approximately 20% fenkon, pinene, limonene, dipenten, felandren, metilchavikol, anisaldehid, anisat acid, and 12% fat oil. 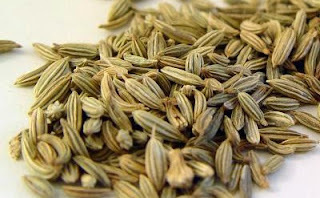 The content anetol causing fennel ejecting distinctive aroma and potent carminative. Root contains bergapten. Roots and seeds contain stigmasterin (serposterin). 1. From an adult human studies, it found that fennel has the effect of destroying kidney stones. 2. The active component, anisaldehyde, increase the efficacy the streptomycin for the treatment of tuberculosis in experimental mice. 3. Fennel oil containing anetol, fenkon, chavicol, and anisaldehid efficacious soothing the digestive tract and work resembles appetite stimulant. 4. Improve gastrointestinal peristalsis, stimulate spending fart. 5. In animal experiments, extracts of fennel leaf decoction can lower blood pressure. But the other way of processing do not show these properties. 6. Eliminate cold and phlegm.